Greed and Violence: A Black Friday Tradition? With a record $52.4 billion spent over the long weekend, it appears Black Friday was a retail success. We should all be happy that consumers are loosening the purse strings after several years. But here’s a dark side that overshadows the good news about this annual event. Shoppers have to worry about their safety not only in the parking lots, but inside the store! If you’re worried about getting one of the great deals just bring your pepper spray to use at a critical moment ensuring you get the desired items. Sound crazy? That’s what one Los Angeles woman did. It almost makes pushing and shoving seem reasonable. Pepper spray was used by a security guard at another store. You don’t want to fall down in these mobs as people have been trampled to death in past years. My sister witnessed a woman in line collapse from a medical issue and was worried she’d get trampled as it was right before the store opened. Fortunately, that didn’t happen to her. But a man in West Virginia who later died had the same problem and shoppers just walked over him to get their bargains. These people aren’t saving thousands of dollars. In most cases, it’s less than a hundred. Google the phrase “Black Friday Walmart” on Youtube and you will find a dozen or more videos of the violence and chaos from this year alone. Why is the retailer giant still unable to manage the shoppers after years of experience and bad results? Walmart has a responsibility to figure out a way to defuse the situation. Whether it be handing out tickets to people in line before opening doors, limiting the number of people in the store at a time or hiring an extensive amount of security there has to be a solution to the violence; because I don’t there’s an answer to people’s greed. The irony is that the goods people are fighting over was available online at the same price. There’s no reason to use your gas and energy running from store to store. Plus, you don’t have to be up all night for staggered store openings. I think I’ll continue doing my Black Friday purchases from the comfort and safety of my home. What do you think about the Black Friday experience? I agree that Black Friday has gotten ridiculous in recent years. My other gripe, besides the violence, is the fact that the stores opened much earlier this year. Many people were unable to even enjoy Thanksgiving dinner with their families because they had to be at work at midnight or earlier. The year that the man was trampled to death outside of a Wal-Mart in NY was the first and last time I ever went shopping on Black Friday. Shoppers are rude, and saving a few bucks is hardly worth worrying over your safety. But as long as people flock out to the stores, things will continue on the path they’re on. I looked at some of the ads and while the prices on items were often impressive, it just wasn’t worth the hassle to either fight crowds or spend days in line. There was someone at the local Best Buy a few days in advance. When you consider that they maybe saved a couple hundred bucks on a TV or whatever, it hardly seems worth it. 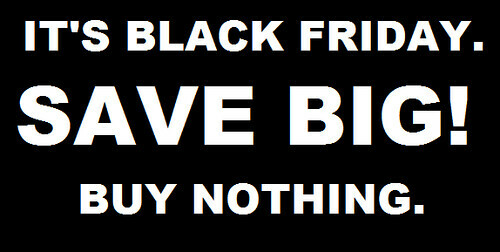 Black Friday pretty much disgusts me these days. All this mindless consumption of a bunch of Stuff we just don’t need. Add to that putting your life in the hands of retailers who obviously don’t care, as long as you are there to spend money. Increased consumer spending is good? I’m not sure you can “buy” enough security for some of these events. A hundred Navy Seals wouldn’t keep someone from spraying another person with pepper spray. The marketing of the sale creates a pent up demand and crowds that are not controllable. I think the store needs to take some responsibility in this situation. Security is not the slution! Stop the first 100 people getting the best deal marketing campaign. If you do that, then you need to pass out bracelets and actually control the crowd. Otherwise, you will have chaos. The people reflectthe crowd mentality which will push or shove and do stupid things. Thursday night, as the commercials were telling me WalMart would be open starting at 10pm for Black Friday deals, I thought to myself, 10pm? That’s when I’m going to bed. I don’t like shopping, and I’m not a fan of huge crowds, so I happily stay home. The savings just aren’t worth it to me. I’m more than willing to pay a little more and avoid the crzy. I cant believe the lengths some people go to for ‘deals’ I’m not going to sit and say that i’m above the black friday fold because I do go out looking for things I’ve been coveting for a while. I have never left the house before 930am and I never look to buy something I dont need and havent wanted for a while. People who do that are just crazy. I would always get dragged to Black Friday sales with my grandmother when I was younger, and I enjoyed the fun of wading through lines and seeing all of the hustle and bustle. Once I got old enough to understand what was going on though, it became sickening. I have not gone to a Black Friday sale in over 15 years and dont ever plan to. In fact, many stores, like Target, are offering the same deals in a 2 days sale, and they save certain sale items so they have some on the second day. You can usually walk right in the second day and score the same deal someone got at 3:0am the previous morning. I think Black Friday has gotten out of control. The violence and greed and lack of basic respect for others is disgusting, especially as it happens the day after Thanksgiving. It’s such a contradiction. I can’t imagine ever using pepper spray or walking over a dying man just to get a toy or a good deal on a TV. I don’t need or want anything that badly. So much for being the season of ”caring and sharing! I agree with Jana’s comment that Black Friday happening – not even AFTER Thanksgiving – but starting that evening – is such a contradiction! What will it take to make people realize the insanity of the time and stress, not to mention their safety, trying to save a few bucks is out of control? But as long as people will shop like this – retailers will allow it…:( Shame on Walmart!